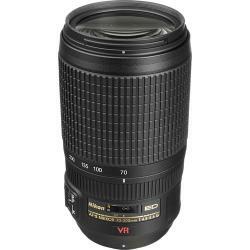 The AF-S VR Zoom-NIKKOR 70-300mm f/4.5-5.6G IF-ED Lens from Nikon is a versatile, lightweight telephoto zoom lens that has been designed to meet the demands of both digital and 35mm format SLR users. It offers a 4.3x zoom with a focal length range of 70-300mm and a 35mm equivalency of 105-450mm when used on DX-format DSLRs. With two ED (Extra-low Dispersion) glass elements to reduce chromatic aberrations and Super Integrated Lens Coating to minimize ghosting and flare, the optical performance of this wide-ranging telephoto zoom is up to the task of wildlife, travel, well-lit sports and general photography applications. Incorporating Nikon's second-generation Vibration Reduction (VR II) system enables flexible hand-held shooting by stabilizing the image to compensate for the blur caused by camera shake. This provides the equivalence of 2.5 shutter speed stops to help in capturing sharper images in low light or at extended zoom lengths. The Silent Wave Motor and Internal Focusing system provide fast and quiet auto focusing action, and the nine-blade rounded diaphragm makes out-of-focus elements blend smoothly to produce natural-looking, harmonious backgrounds. A lightweight telephoto zoom for FX format DSLRs provides extensive reach to magnify distance subjects. When used on a DX-format DSLR, its 35mm focal length equivalence is 105-450mm. The Silent Wave Motor (SWM) enables quiet auto focusing with quick and convenient switching between auto focus and manual operation. The Internal Focusing (IF) design for a fixed lens length and non-rotating front element allows the use of circular polarizing filters and lens-mounted flash accessories. 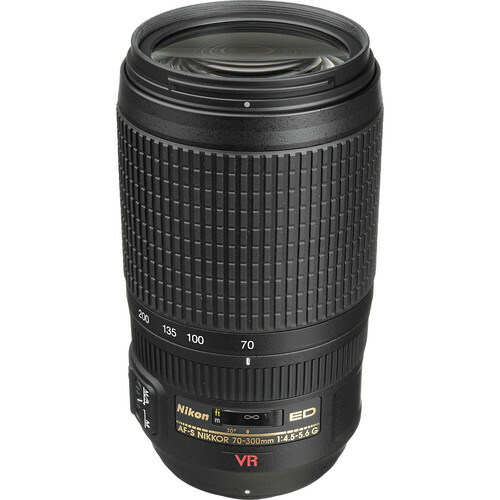 Vibration Reduction, engineered specifically for each VR NIKKOR lens, enables handheld shooting at up to 2.5 shutter speeds slower than would otherwise be possible for sharper still images and video capture. Two ED glass elements minimize chromatic aberration across the entire zoom range while ensuring high resolution and contrast. Nikon's proprietary lens coating improves light transmission, reducing ghosting and flare.